The directors of Simonds Farsons Cisk reported an increased performance for the group to its shareholders at its 71st annual general meeting. Group turnover registered a robust eight per cent increase, reaching €95 million, while profit before taxation increased by 18 per cent, reaching €13.5 million. Farsons’ chairman, Louis A. Farrugia, reported on the financial highlights of the year and delved on the process followed to spin-off Trident Estates as a separate public listed company in line with the approval by shareholders at the previous AGM held in June 2017. The group’s CEO, Norman Aquilina, gave a presentation of the performance by the group and, while reporting that all businesses registered improvements in their performance, he emphasised that the intensity of competitive activity was increasing. Nevertheless, the group was seeking growth opportunities both in the local and export markets. “Farsons is well placed to maximise the benefits of its multimillion investment programme and is further improving its brand proposition,” said Mr Aquilina. During the meeting, both Max Ganado and Roderick Chalmers were uncontested and re-appointed as directors. 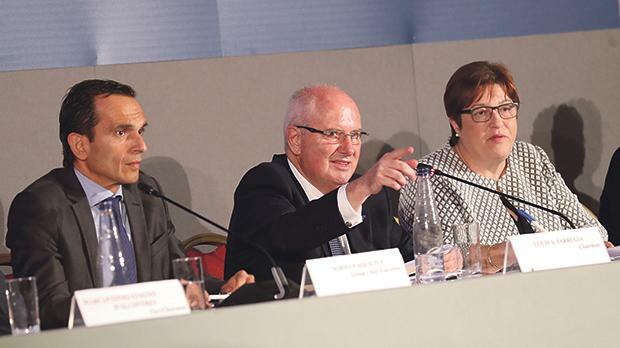 The composition of the board remained unchanged, in that Baroness Christiane Ramsay Pergola and Michael Farrugia, who retired in terms of the company’s articles of association, had their post reconfirmed.